special occasions such as birthdays, anniversaries, or Christmas. Sometimes we even give gifts to say that we are sorry after an argument. But why not give a gift just because? Of course I mean romantic partner whenever I say spouse. I know not everyone is married. But often after people are married they forget about romance. Don’t let that be you! A true romantic keeps the romance alive! gifts are meaningful to the person who receives them, and they work because they are chosen with a great deal of thought, care and without expectations of reciprocation. This can be accomplished simply and with little effort. Whenever you are out shopping alone, look for things you think he or she would love to have or would appreciate. Pay attention when you are out with him or her and notice anything that catches their eyes. Then come back later and buy it for them as a surprise! They will be truly touched. to stores that carry rare or unique items, including antique stores, bookstores, second-hand shops, toy stores, video stores, sporting goods stores, card shops, etc. When you go shopping, don’t put too much thought into it. Let your intuition be your guide in shopping for your spouse! Always be prepared to buy something for your spouse when you are out. Keep a “gift” fund in your wallet so that you are always prepared to buy that special item that you might come across. Keep a list of things that you can refer to, also. to always think about your spouses wants and needs when shopping for him or her. Here are some Gifts for Any Romantic Occasion. Chocolate is always appropriate, unless they are allergic to it! If so, try flowers or jewelry! For Coffee lovers, you have it made. They will think of you every day while enjoying their Java. Flowers are always in style! 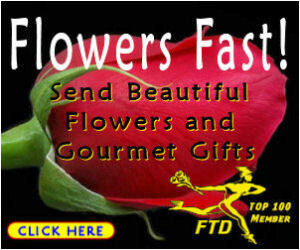 If you would like Romantic Gifts for Valentine’s Day, click here. Ready for an Engagement Ring? Romantic Engagement Rings are available here.